Our friend, Eek the Owl, has shared with us some frighteningly fun ideas to make the Halloween season even more enjoyable. He has the whole family covered: chefs, crafters, adventurers, and board game aficionados! There’s something for everyone in our Halloween Family Activities Guide! Feel free to take a gander and try out some of these activities with your family this Halloween season! And be sure to subscribe to The Big Scare for even more ideas! Any opinions expressed in the following article do not constitute an endorsement of any product or retailer. The following is for information purposes only. Any instructions are for information purposes only. The Big Scare cannot guarantee you will experience the same results as we did should you opt to use these instructions. Feel free to share ways to improve the instructions in the comments section below. All activities should be conducted under adult supervision. Our first wise idea involves everyone’s favorite holiday activity — baking. And, as Eek points out, it’s not just for wintertime. Halloween provides the opportunity to create all kind of creepy concoctions. From cut-out cookies to brownies, they all make perfect October baking projects. While brownies are devilishly delicious by themselves, there’s just something even more appealing about a Halloween Brownie. Making Halloween Brownies is just as easy as baking regular brownies. You do exactly what your favorite recipe (or box) tells you to do, but you change up a few things before putting the batter in to bake. Rather than just pouring the batter into a pan, you want to line the pan with greased aluminum foil. Basically what you want to do is rip out a piece of baking foil and place it in your baking pan, pushing it up against the sides, making sure the whole thing (meaning the entire bottom and all the sides) is well covered. Press the tin foil against the sides of the glass or metal pan so that it hugs it and assumes the pan’s shape. Ensure that there is enough room left to lift the foil up out of the pan when the brownies have baked. Then proceed to grease (and flour) it as you normally would or as you are instructed to in the baking directions, so as to prevent the brownies from sticking. Bake the batter as directed. Remove from the oven and let set until cool. Now comes the fun part. Take some open Halloween cookie cutters (meaning ones that are just outlines that do not have tops which would prevent the cutter from cutting through thick brownies) and cover them in powdered sugar. (Make sure your cookie cutters are deep enough to cut through the thick brownie cake. You can buy these cookie cutters at a number of major retailers. They usually come in “tubs.”) Press each cookie cutter all the way through the brownie cake, just as you would with cookie cutters in cookie dough. Carefully remove your brownie shape and place it aside. Continue to press cutters into the remaining brownie cake until the area of usable brownie cake has been cut. Take the cutout shapes and decorate them with frosting, powdered sugar and candies. Use the “scrap” brownies, the unused edges that are leftover, to add layering and detail to your treats — or just eat them! In a world seemingly run by electronic entertainment, it’s sometimes hard to remember that other forms of fun exist., like board games! And when those board games have a Halloween theme, their fun level quadruples. There are a number of Halloween-themed board games available on the market, and plenty more that can be purchased secondhand. One of the easiest games to track down is Halloween Boo-Opoly. 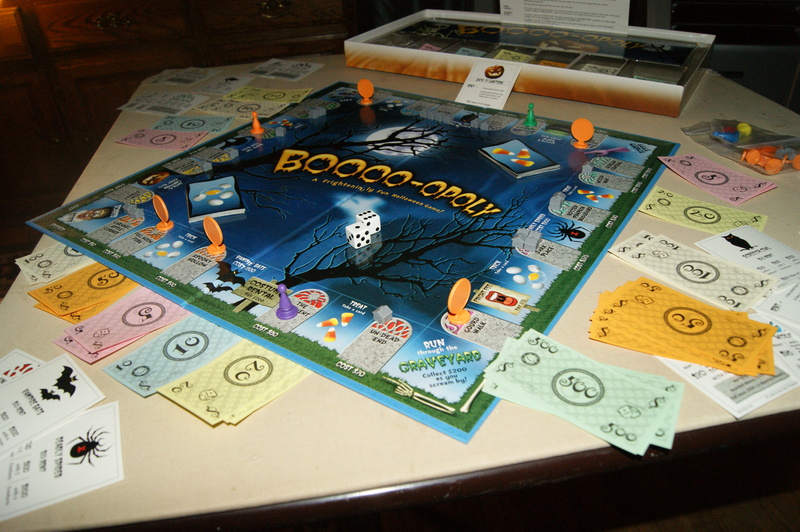 Much like the game from which it derives its objective, Boo-Opoly allows players to buy properties, many of which will be familiar (like Elm Street) and many of which will be new (Gourd Walk). The old railroads are now different creatures of the night, and the utilities consist of Jack-O’-Lanterns and Witch’s Brew. Instead of houses and hotels, players may buy Haunted Houses and Full Moons. The gameplay is quite similar to Monopoly, but there are some slight differences. Overall, it’s a fun game with a nice design. The only thing that would make it better would be if the playing pieces weren’t just plain plastic pawns, and instead were shaped in the forms of Halloween characters. And if Boo-Opoly isn’t quite your game, there are plenty of other options. From vampire games to zombie games, a trip to the local toy store is certain to reap a nice harvest of spooky entertainment — especially at Halloween. Most families pick up pumpkins from their local grocer (or the super-center which has invaded their neighborhood). And while it is great to have access to affordably-priced pumpkins, there is just something missing from the experience. So, while you may opt to get your larger carving-friendly produce from the grocery store, a trip to the local (or not-so-local) pumpkin patch should be in order for your family this year, even if you don’t make your big pumpkin purchase there. Not only do many patches provide fresh, right-off-the-vine pumpkins, they also provide a ton of activities for your family. The experience that pumpkin patches provide is unprecedented. Many of them have games, hayrides, corn mazes, and photo opportunities that the grocery store can’t possibly match. So, even if you can’t afford a large pumpkin from the patch, your family should still make a visit, maybe pick up some Indian Corn or smaller pumpkins, and take advantage of everything that is offered. It will be a memory your family will never forget. Now that you have found the perfect pumpkin and are already to carve it, you probably are wondering what to do with all of those insides! We have the perfect solution — for the seeds at least! 1. Immediately after carving your pumpkin, remove the seeds and rinse them thoroughly. After they have been cleaned, pad them dry and let them sit for several hours in a warm place. 2. 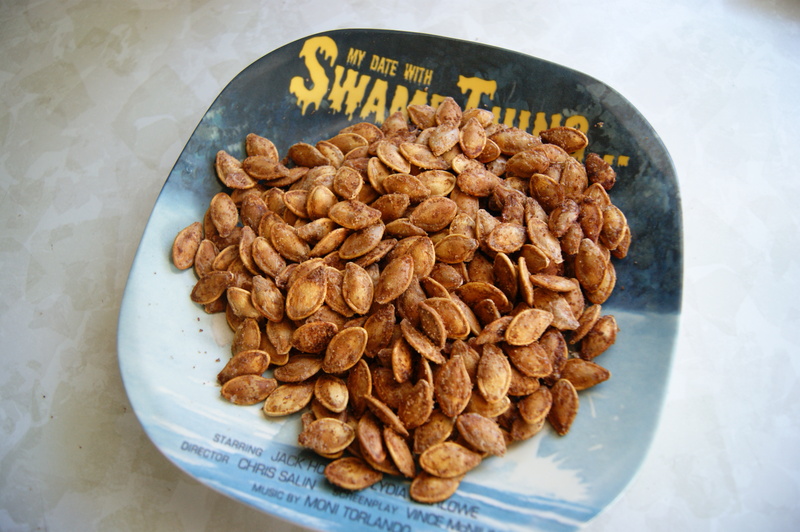 Preheat oven to 300 F. Once the pumpkin seeds are completely dry, place them in a mixing bowl and add 1 tablespoon melted butter for every one cup of seeds. Mix the seeds so that they are completely coated. 3. Sprinkle in garlic powder and salt, enough to taste. Mix until every seed has a light covering. 4. Pour the seeds onto a foil-lined baking sheet. Spread the seeds so that they form a single layer. It is important not to have them overlapping. 5. Place the seeds in the oven and let bake 50 minutes, mixing them every 15 minutes or so. 6. Add additional seasoning as desired and enjoy! If you have ever wandered into an arts and crafts store in the fall, you have undoubtedly seen a variety of pre-packaged art projects that can be used to dreary up any bright October day. 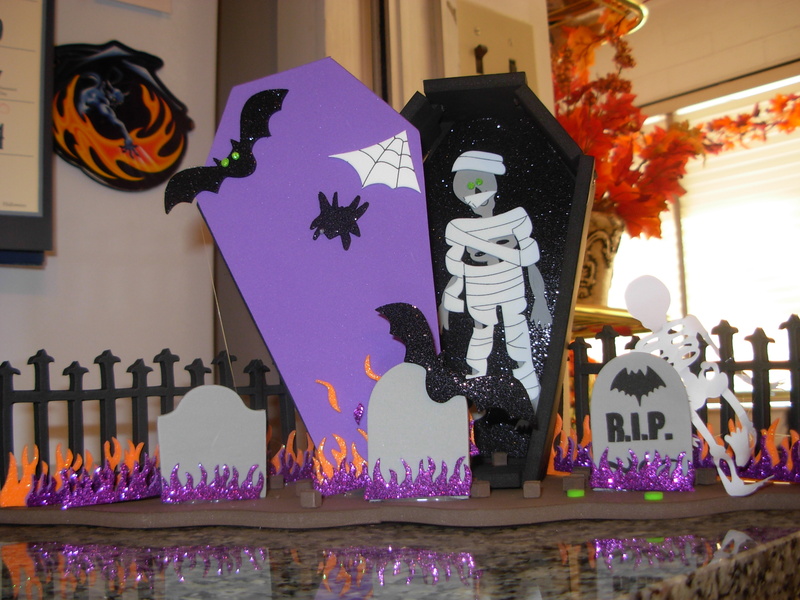 Kid-friendly foam kits, which let you and your family create haunted scenes out of small pieces of pre-cut foam, are just one example. The variety of these kits has really expanded in recent years, and now you can create all kinds of things: graveyards, haunted houses, masks, monster boxes, cars, and more! A lot of these kits don’t actually require much skill. Some come with foam stickers, meaning you don’t even have to glue anything! That is why they are good for the younger set as well as the older crowd. But each kit is different, so be sure to read the box for details before considering a purchase. One of the nice things about these kits is that they allow for a lot of customization and personalization. You have the freedom and ability to place characters and other scene-setters in a variety of places on the foam bases, while still maintaining the same structure suggested by the manufacturer. You can even add your own foam pieces or mix pieces among a number of kits. These kits get the whole family involved in the building process and make great decorations when finished. And there are a variety of ways you can incorporate the kits into your Halloween festivities. You can buy one to assemble with the kids on a stormy evening, you can buy a number and have a family foam-building contest, or you can have a variety available at a kids’ Halloween party, set up tables, and have the party-goers bring their own creations to life. Another great option is the Cookie Decorating Kit. We all know the classic Gingerbread House kits that come out at Christmas. In recent years, many manufacturers have introduced Halloween-themed kits. Take for example, the Cookie Graveyard kit from Target. It is easier to assemble than a house, but just as fun. The kit contains a cookie base, cookie tombstones, icing, as well as bat, bone, and ghost decorations, in addition to other candies that can be used to help decorate the edible display. If you can’t track down this particular kit, check for alternate versions at other retailers. There are a ton to choose from! While you may already have enough chocolate in your house during the Halloween season, you may still be tempted to get some more, especially when you can create your own candy concoctions! Companies like Wilton produce a lot of chocolate molds and kits that function as great activities for the whole family. 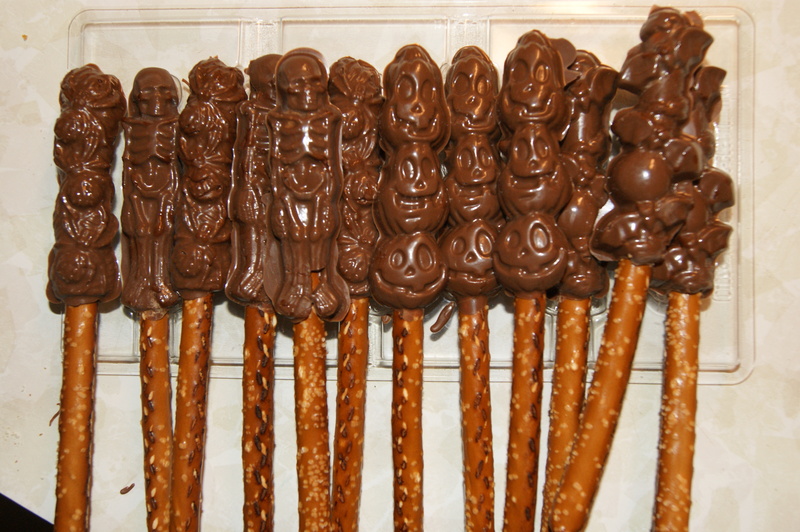 Spooky Chocolate Dipped Pretzels are just one example. All you need to do is stick the chocolate in a bag, put it in the microwave, squish the bag with your hands, and then pour into the molds. Stick them in the fridge for about 30 minutes. And voila; you have some awesome Halloween treats for all those special little boys and ghouls in your life! What a terrific idea for parties! And these would make great gifts for the office staff on Halloween day! 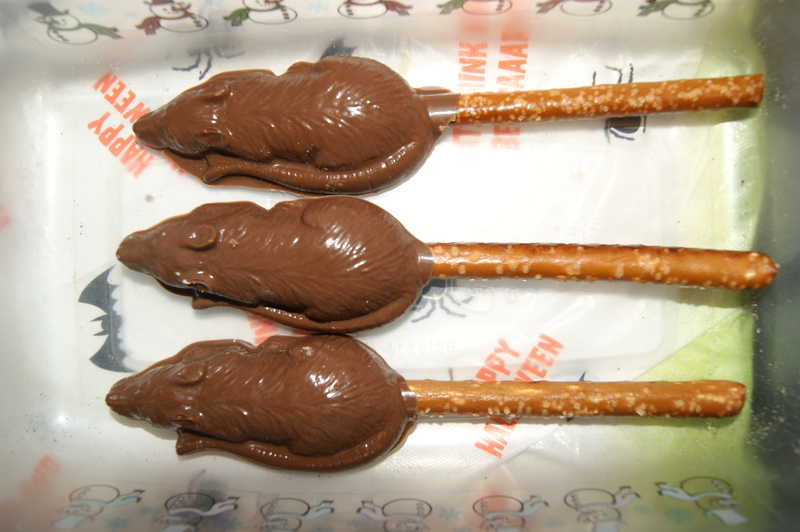 The best molds are definitely the rats. These things are huge – and you get 4 rat molds, so you can make a whole family at one time. The second best molds are the skeletons, followed the pumpkins. The bats and spiders are fun, but my final versions didn’t turn out as great as the previously mentioned molds – though they are still pretty nifty. Regardless, this kit is well worth the affordable price. It makes for a great weekend activity to do with the kids or with yourself. Plus, how can you beat the spooky, edible payoff? The product is available to purchase at various locations: craft stores and other retailers. And if you aren’t a fan of homemade chocolate creatures, there are plenty of other food craft kits out there – like the JELL-O Jigglers and the Rice Krispy Treat Pumpkins. 1. Paint the skulls the colors of your favorite sports teams. Even consider painting a logo on the top! 2. Paint your skull with a base color and then add “metalic” coloring for a shiny look. 3. Give your skulls a classic Halloween treatment by painting them orange and black. 4. Give your skulls a tie-dye look. 5. Use stencils to add images to the top and back of the skulls. Once you’re done, consider adding them to your current Halloween decor. Or how about using them as table toppers or as party favors? The possibilities are endless. 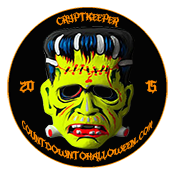 We will be adding to this page as we think of more activities, so why not subscribe to The Big Scare for the latest undead updates?